The Australian Centre for the Moving Image has a fascinating website that’s very helpful to educators. 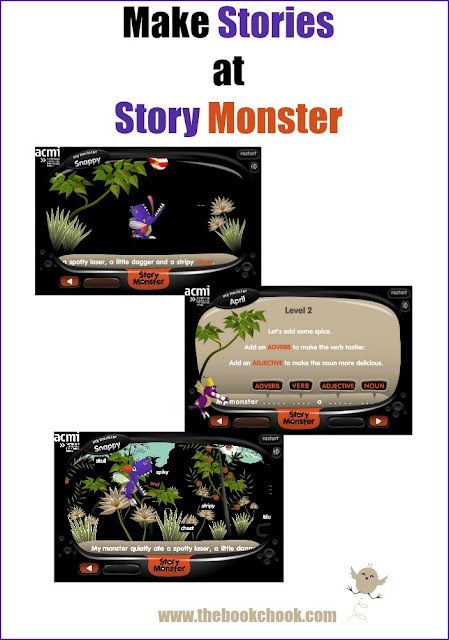 One of the resources there is an attractive literacy game called Story Monster. Monsters are perennial favourites with kids, aren’t they? Whether in books, apps, or movies, combining monsters and literacy works very well. Designing a monster at Story Monster is loads of fun. Once you’ve chosen the best combination of body parts and colours, you’re invited to choose a story setting - adventure, fantasy or science fiction. Then you dress your monster to suit, choosing hat and shoes. After that it’s up to players to follow directions and use up/down arrows to guide their monster, and space bar to have their monster eat the words according to the instructions. For example, my pink flying croc monster, Chuck, flew along, being instructed to eat a verb, then a noun in a sky dotted with both nouns and verbs. I ended up with the sentence, “My monster vomited a wand.” I could hear it read aloud as I followed it with my eyes. Next, a little animation made my sentence come to life (blecch! thanks for that!) In my next level, I chose adventure for my story world and had to come up with an adverb, verb, adjective and noun. Result? “My monster loudly farted a pink dagger.” Kids will enjoy the nonsense, and along the way learn something about grammar and writing. There’s a useful Story Monster resource kit available for download on the ACMI home page. I certainly didn’t see anything in Story Monster not suitable for children, but teachers should note that kids under 13 need parental registration.